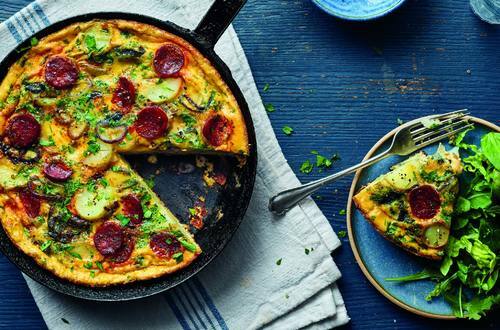 Our Spanish omelette recipe will keep you going all day. Treat yourself to this great mix of chorizo, potatoes, eggs and Hellmann's® Real Mayonnaise. 1 Beat eggs, Hellmann's® Real Mayonnaise, parsley and black pepper in small bowl with wire whisk; set aside. 2 Lightly brown chorizo in large nonstick skillet sprayed with no-stick cooking spray over medium heat, stirring occasionally. Add potatoes and onion and cook, stirring gently, until onions are almost tender, about 5 minutes. 3 Add egg mixture. Cook over low heat, lifting set edges of omelet with spatula and tilting pan to allow uncooked mixture to flow to bottom. Cover and cook until omelet is set, about 5 minutes. Garnish, if desired, with additional chopped parsley.